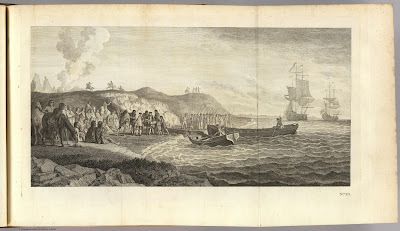 Captain John Byron and landing party in the Strait of Magellan, artist unknown, engraved for An account of the voyages undertaken by the order of His present Majesty for making discoveries in the Southern Hemisphere, and successively performed by Commodore Byron, Captain Wallis, Captain Carteret, and Captain Cook, in the Dolphin, the Swallow, and the Endeavor, 1773, David Rumsey Map Collection. 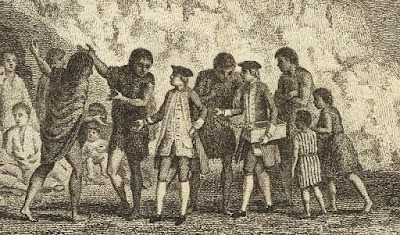 One of the much vaunted survivors of the Anson Expedition and the Wager Mutiny, John Byron is remembered as a skilled mariner and experienced explorer. This engraving is drawn from a compendium of contemporary explorers printed in London during the years leading up to the American Revolutionary War. 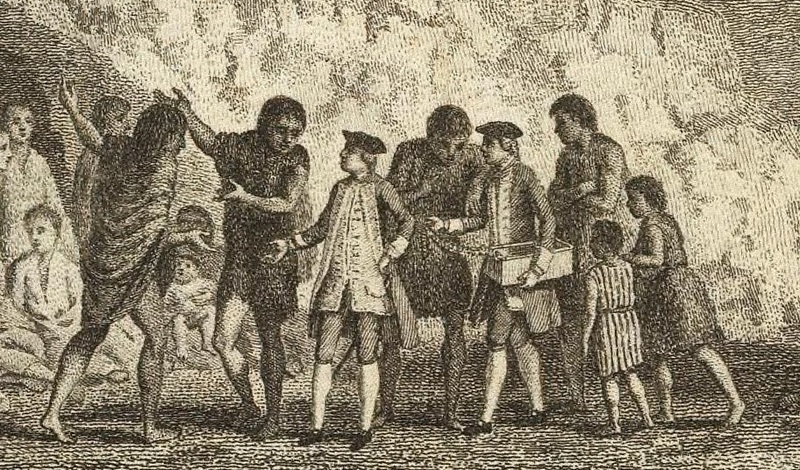 The unknown artist depicts Byron and his men visiting the "gigantic" people of Patagonia. As described in his 1767 memoir of the 1764-1766 Dolphin expedition, Byron's visit to Patagonia was an extraordinary one. The Dolphin having entered 10 or 12 leagues into the mouth of the streights of Magellan, the men on deck observed thirty or forty people of an extraordinary stature, standing on the beach of the continent, who looking attentively at them, made friendly signs, by which they seemed to invite them to come on shore; white others who stood aloft, discovered with their glasses a much greater number, about a mile further up the country; but ascribed their apparent size to the fogginess of the air. The ship happening at this instant to be becalmed, the honourable Mr. Byron, thinking no time would be lost by going ashore, resolved to land, in order to see the Indians and learn what he could of their manners; he therefore ordered a six-oared boat for himself and his officers; and one of twelve oars to be filled with men and arms, as a security, in case there be any attempt to surprize or injure him, or any of those who went with him; tho' the people on shore did not seem to have anything like an offensive weapon among them. They Patagonians were indeed "of an extraordinary stature," and we can see them dwarfing Byron and his lieutenant in the detail above. Byron thought the experience to be notable enough to be featured as the frontispiece to his book A Voyage Around the World. The sailors bearing muskets and bayonets ashore are wearing cocked hats and round hats with narrow brims. One in particular turns toward the view and gestures to the left of the frame, and he appears to be wearing a barge cap. The men all wear jackets that end at the top of the hip or just below it, save for the oarsman in the foreground whose jacket extends to at least the top of the thigh. They all wear their hair bob style, if not bewigged. 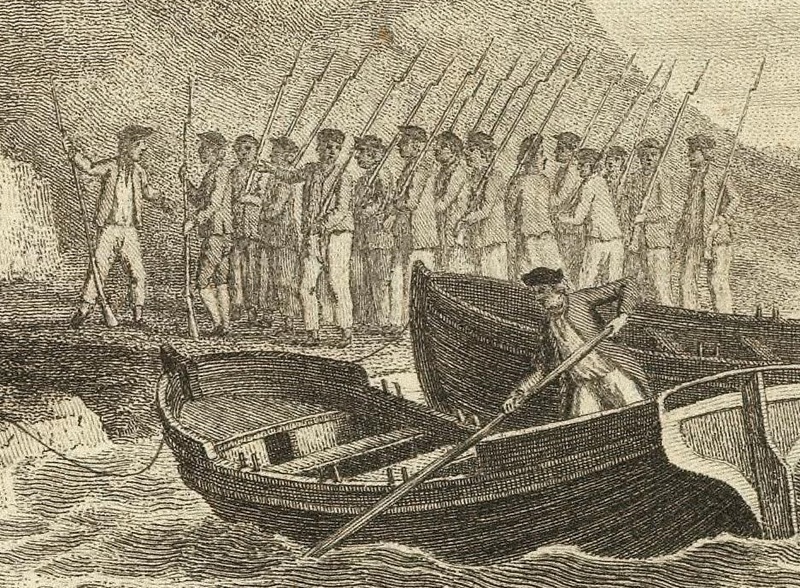 Most of the sailors wear trousers, though one near the front of the line is wearing dark breeches (probably blue) and one sailor near the middle and facing to the right of the frame appears to be wearing petticoat trousers. 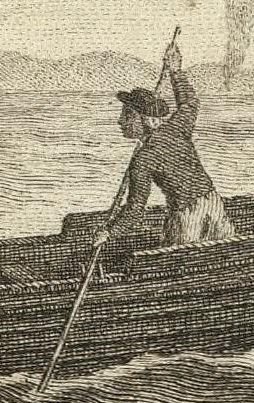 The coxswain of the other boat wears a cocked hat with very short brim, what appears to be a bob wig, a jacket, and trousers or petticoat trousers.